This article first appeared in the Shamrock Rovers match programme double issue nr. 8 in 2005. Regular readers of the programme will agree that up there along with “Finn Harps” the most common answer to the question “Which set of opposition fans do you rate the most?” which is put to interviewee’s of Les Lowe’s excellent “ Spotlight On A Fan” would be those of next Friday’s opponents Derry City. Indeed, there has always existed a good relationship between Rovers and Derry [and Harps too!] A lot of Hoops would have a soft spot for the Candystripes, except of course, for the 90 minutes we’re playing them or when reminiscing on the Cup Final of 2002! Older fans will remember the disgraceful way that City, as a team from a Nationalist area playing in Unionist state, were treated, which eventually led to the club withdrawing from the Irish League on Friday 13 th October 1972. Thankfully for Irish football Derry entered the League of Ireland in 1985 and remain to this day. The dark days of the early seventies are hopefully behind us forever and the Setanta Cup is hopefully the start of something much, much bigger. Sadly there is another club that withdrew from the Irish League in 1949 never to return, whose history is tied in with that of Shamrock Rovers. I am of course speaking of the mighty Belfast Celtic. At a time when the very existence of Rovers has come under threat, it’s perhaps apt to remember this mighty club from where the famous Hoops of Shamrock Rovers came from. In an age of extreme bigotry, sectarianism, poverty and social deprivation, Belfast Celtic offered a beacon of fair play and sportsmanship to that city’s beleaguered working class Catholics. It exerted an enormous influence on them and gave purpose to their lives. As one former supporter recalled, “ When we had nothing, we had Belfast Celtic. Then we had everything”. Since its formation in 1891, the Belfast club had set out to model itself on Glasgow Celtic through its attractive style of play, its work for charity and its non-sectarian signing policy. When secretary Bob Hayes wrote to the Glasgow club, the financial donation that Belfast Celtic received in return added to the initial subscriptions of nine shillings raised at the inaugural meeting. Under an astute board of management, it operated a highly profitable financial institution, searching out the best players available and signing them for what was, in those days, big money. Among its supporters, Belfast Celtic’s home ground was known as “Paradise” – a nickname that needs no explanation. The most memorable clash between Rovers and Celtic from a historical perspective would have to be without doubt Milltown’s official opening which took place Sunday 19 th September 1926. Reflecting a sign of the times, certain sectors of Ulster society were outraged because they did not approve of football being played on a Sunday! The support base from West Belfast however, were far from outraged as special trains had to be organized by the Celtic Committee to ferry the four thousand traveling supporters to Dublin. The crowd was the biggest gathering of people ever seen in the Milltown area of Dublin up to that point! Back: left to right: Joe Williams, Jim Blake, Tommy Donnelly, Mick McCarthy, Harry Finnegan, Christy Flood. Front: left to right - Paddy 'Sonny' Molloy, Joe Ward, Jimmy Dunne, Billy Meek, Eddie Dunne. The following is an excerpt from our Programme Editor Robert Goggins’ 1993 book “The Hoops” written in conjunction with Paul Doolan. “Rovers provided a thousand sideline seats and a refreshment pavilion for the occasion. The gate receipts of Four Hundred and Fifty Six pounds represented a crowd of 18,000, the maximum the ground would hold. The crowd included a small group from Newry where Rovers had recently played in an exhibition game. A party of eighty traveled from Athlone for the occasion and the quiet sleepy village of Milltown, hitherto unknown amongst the masses, was never to be the same again. This game marked the first appearance of “Lye” Golding, an outside right whom Rovers had signed from Brideville. 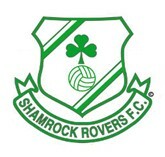 The full Rovers team was O’Callaghan, Malone, Kirkland, Doyle, and Marlowe. Glen, Golding, Leonard, Egan Fullam and Fagan. Rovers began the game well and outshone Celtic in every sector. There was a lot at stake as the unofficial title of All-Ireland champions was being contested. Celtic got the first goal; despite the fact Rovers had enjoyed most of the play up to then. O’Callaghan failed to control a shot by Hanna and when “Doc” Malone failed to clear S. Mahood stepped in and sent the ball into the unguarded net. Rovers were back on level terms ten minutes later, though when the Celtic right half, Pollock, controlled a shot by Golding with his fist and Bob Fullam beat Diffin with the resultant penalty. After that it was Rovers who maintained the bulk of the pressure. Celtic improved on their performance in the second half and got the winning goal mid way through this period. It was centre forward Hanna who secured the winner with a low shot past O’Callaghan following good work by Stanley and Jack. For Celtic however, it all ended in sadness and bitterness forever following the dramatic 1-1 game against Belfast rivals Linfield on St. Stephens Day 1948 which was an atmosphere charged event watched by a crowd of some 40,000 and saw players from both sides sent for an early bath. Linfield finished the game with eight players on the pitch! During the course of a hard fought game Linfield’s Bob Bryson suffered a broken ankle in an accidental clash with Celtic’s Jimmy Jones. The assertion that this injury was incurred accidentally was accepted by the Linfield board of directors in their statement that was released after the dramatic events. The announcement at half time over the public address system that Bryson’s right leg was broken was blamed by many for all that followed in an already tense encounter. In a strange co-incidence Bryson had actually played for Rovers earlier in his career! Whether the broken leg was caused by being pushed or jumping from the wall in an attempt to escape or by the continued attack after Jones landed on terra firma is, at this stage a moot point. What cannot be denied is that responsibility for what happened to him lay firmly with those who pursued and attacked him. There have been suggestions that a boardroom dispute concerning the ownership of shares and the appointment of directors had been rumbling in the background before the events of St. Stephens Day of 1948. It is the belief of some that the events of that day gave the directors all the excuses they had been waiting to wind down the Belfast Celtic Football & Athletic Club. Strangely the company minutes of that crucial period are missing so the speculation continues to this day. Jimmy Jones was quoted at the time “ Maybe there was other things and when everything was added together, this was a contributory factor. I think the fiasco at Windsor Park was what pushed them over the precipice”. 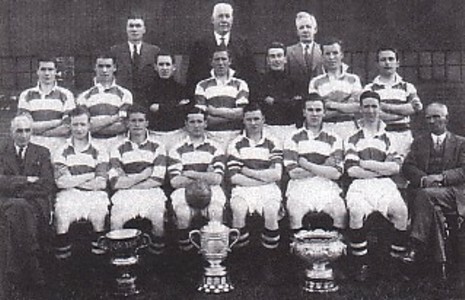 Irrespective of what the exact motivation for withdrawing from competition was, once Celtic had completed that seasons fixtures and competed in the North American tournament of 1949 where further controversy erupted back in Belfast when Elisha Scott was requested at the last minute to carry the tricolour with Charles Connolly, editor of the Irish Echo, one thing can never be denied is the football going public of Belfast and Ireland suffered a loss from which it has never recovered. During their time in competition, Celtic had won the Irish League fourteen times, the Irish Cup eight times, the City Cup Winners ten times and the Gold Cup seven times. An amazing record for a club that only competed in competition for fifty-eight years. So how did it come about that Shamrock Rovers adopted the Hoops having played in vertical green and white stripes up until 1926 and why was there such a close relationship between Rovers and Celtic? “ The following season. 1926/27, there was to be no joy for Rovers when they were knocked out in the first round by Bray Unknowns at Shelbourne Park. Bray had been in membership of the League for three seasons beforehand and had hardly set the scene alight but on that day they beat Rovers 3-0. Rovers had their chances but Leonard, in goal for Unknowns, was outstanding and time and time again denied the Rovers forwards. It was a home draw for Bray but so great was the expected crowd that the tie had to be switched to Shelbourne’s ground. The referee was Mr. J. Stack of Belfast. Personally, I agree with Robert and feel that it was this pro Irish - Ireland stance which would have endeared the founding fathers of Shamrock Rovers to those involved with Belfast Celtic Football Club, which was very much a Nationalist fish swimming in a Unionist sea, both before and after partition. John Sheridan’s proposal regarding the hoped jersey was in my opinion a practical, permanent expression of the close ties the clubs shared. On a point of clarification, despite the fact that Celtic was based in West Belfast and would obviously have had a similar Irish – Ireland ethos to Rovers, it never considered itself nor carried out its business as an exclusively Catholic institution. Religion was left at the gate when playing for the Celt’s, and rightly so. The manager of the club for its last fifteen years of competition, Elisha Scott the famous former Liverpool goalkeeper, who himself came from the Protestant Donegall Road was once quoted thus “ I don’t play good Protestants or good Catholics. I just play good players”. I could not help but be reminded of the legendary Jock Stein on first reading those admirable words. Scott was a man of honour and always kept his word, the veracity of those comments in relation to good players can be gauged from the fact that during his time at Paradise 1936 –1949, Celtic lifted no fewer than 31 trophies!! The legacy of John Sheridan mentioned above is a very important one in the annals of Shamrock Rovers due to his historic suggestion regarding the jersey’s design and I for one feel he should be reclaimed from the history books. Hopefully in the future a fitting memorial stained glass window, statue or perhaps plaque in or around the Tallaght Stadium? Sheridan’s involvement with Rovers goes back to the very early days. After the clubs formation in 1901 it had gone out of existence by 1906. Sam Beatty’s barbers shop in Bridge Street; Ringsend was the venue for the meeting in 1914, which saw the re-emergence of the club. John Sheridan was present at this historic gathering. Indeed he went on to be very active on the Committee and later became Chairman of the Club. John’s son Martin was one of those interviewed for “The Hoops” who helped to clarify that 1901 was indeed the year Rovers were formed as opposed to the previously held popular belief that the year was 1899. Sheridan Snr. was not simply a back room man either he played for club for a number of years too! Martin Sheridan told Robert Goggins back in the early nineties that he still had the medal his father won for Rovers in the final of the Leinster Junior Cup in 1904/05 when they beat the Royal Irish Fusiliers 4-3 in the final at Dalymount Park. 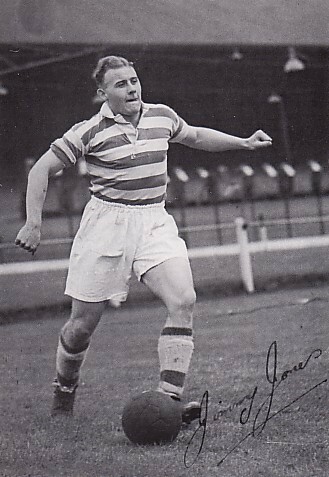 Rovers met Celtic on numerous occasions in the Inter City Cup down through the years and each club provided the other with the opposition for testimonials including the Jimmy Dunne benefit game on 31 st August 1942, which ended 2-2. Interestingly Jimmy had been interned “in mistake” for his brother Christy, an active Republican, by the newly formed Free State government in the early 1920’s. Internment being something that the Celtic fans predominantly from West Belfast would have been very familiar with! Despite Celtic’s departure in 1949 the connections and links down through the years have remained a constant. While attending this years Programme Fair in Pearse Street I picked up a copy of the programme for the Cliftonville vs. Rovers game held at Solitude on 1 st August 1986 which was a testimonial for Cliftonville stalwart Brendan Tully. Brendan’s uncle was the legendary Charlie Tully who wore the Hoops of both Glasgow and Belfast Celtic. 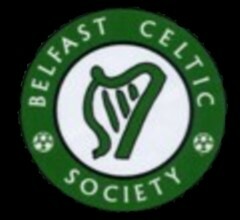 In November 2003 The Belfast Celtic Society was established to encourage an appreciation, knowledge and awareness among the general public of the historical and cultural heritage of Belfast Celtic Football and Athletic Club. The Society was granted charitable status and one of its main aims is to raise funds for charitable causes. The below is an excerpt from their information leaflet“ The Belfast Celtic Society is an inclusive, non-sectarian, anti-racist organisation in the spirit of Belfast Celtic Football and Athletic Club. Membership of the Society is open to individuals irrespective of age, gender, ethnic identity, nationality, sexual orientation, race, religion or political opinion. It is our intention to arrange open lectures and public meetings, maintain a traveling photographic exhibition; establish a permanent collection of Belfast Celtic memorabilia in Belfast and actively use the internet to raise awareness of the traditions of the Grand Old Team"
The annual membership of the Society is twenty pounds sterling and they can be contacted through their Honorary Treasurer Paddy McIlroy, 25 Ranfurly Avenue, Bangor BT20 3SJ or through their excellent website www.belfastceltic.org I myself joined up in 2004 and would have no hesitation recommending to all Rovers fans to do the same as the history and culture of our club is intertwined with that of the Belfast Hoops. Perhaps the 400 Club, the Ultras and the Supporters Club’s could each join in a repeat of history, as this would be a permanent, practical expression of solidarity, just as John Sheridan’s suggestion regarding the design of the jersey was, all those years ago. When the day finally arrives, hopefully in the near future, that a Rovers side runs out onto the hallowed turf of Tallaght for the game to mark the ground’s official opening, while Belfast Celtic FC cannot re-enact the events of 1926 and provide the opposition on the day, it is my sincere heart-felt wish that the Belfast Celtic Society be given the red carpet treatment as our invited Guests of Honour. After all, They gave us the Hoops. The Hoops - A History of Shamrock Rovers. Paul Doolan & Robert Goggins . Belfast Celtic Society information leaflet. The lads from the Derry City forum.